UPDATE: Writer Marc Guggenheim, named as the author of the draft in the report below, has denied its veracity. Read here for more. According to an explosive report at Cosmic Booknews, a Green Lantern 2 script has already been written--and they've got details. In addition to the revelation that Kevin Michael Richardson, who plays Kilowog on Green Lantern: The Animated Series, will step in to replace the late Michael Clarke Duncan in the film version as well, Cosmic Booknews lists a ton of information about the plot, which paints the general picture of a Sinestro Corps War movie. 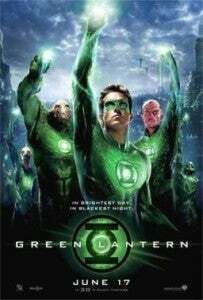 According to the site, the film will take place mostly in space and revolve around Sinestro's defection from the Green Lantern Corps to form his own, more efficient Corps. After running afoul of Hal Jordan a few times, Sinestro reportedly kidnaps Carol Ferris and brings her to his homeworld of Korugar, where Amon Sur, Arkillo, Sinestro and their recruits have set up a Sinestro Corps. A climactic battle will end in a retreat, but not dismantling, of the Sinestro Corps and build to a third film; a "war of light' is hinted at. The DC Universe's Warworld also plays a part, which points to Mongul, although he's not specifically mentioned in the plot synopsis at the site. Notable exceptions would obviously have to be made from the Sinestro Corps War story as it occurred in the comics; it's unlikely fans will get to see Hal Jordan throwing down with the Anti-Monitor or the Cyborg Superman, for example. The site also reports that Ryan Reynolds, Blake Lively, Mark Strong and Geoffrey Rush, who played Hal Jordan, Carol Ferris, Sinestro and Tomar-Re, respectively, are all slated to return for the sequel. While the report may be taken by most with some degree of skepticism--the failure of the first film both critically and financially, followed by a long period of radio silence, seemed to indicate that the sequels may not happen as planned--Cosmic Booknews takes great pains to remind readers of their track record of success with DC Entertainment movie rumors.